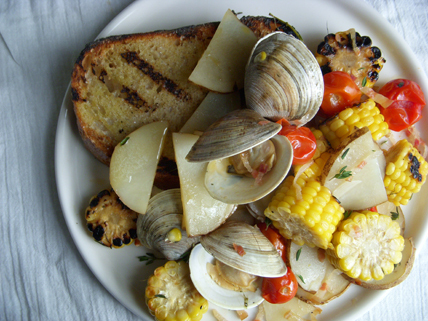 Shore clams, corn, and tomatoes highlight this wonderful Clam bake recipe. Divide ingredients between two pieces of heavy-duty foil. Fold and close edges to form a pocket. Grill for ten minutes and turn. Grill for an additional 10 minutes. serve with slices of grilled and buttered bread.